Today I am sharing a card using the beautiful Mason Jar Bouquet stamp set from this month's release. Sometimes a clean & simple card is just as pretty as one with many layers and embellishments and I really liked how the colors and design of this one turned out. 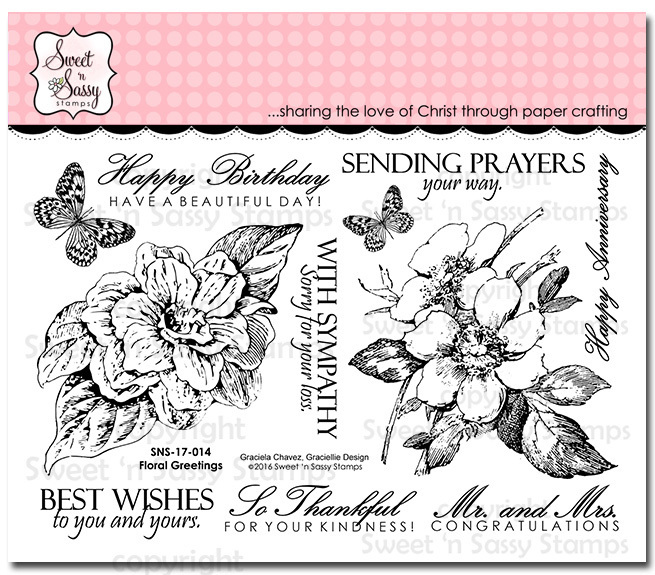 I inked just the center of the Floral Pattern Background stamp with a small Memento dew drop pad and left the edges un-inked. The flower was cut out and popped up with foam dimensionals. Some Stickles in the flower center and a few sequins finished it off. 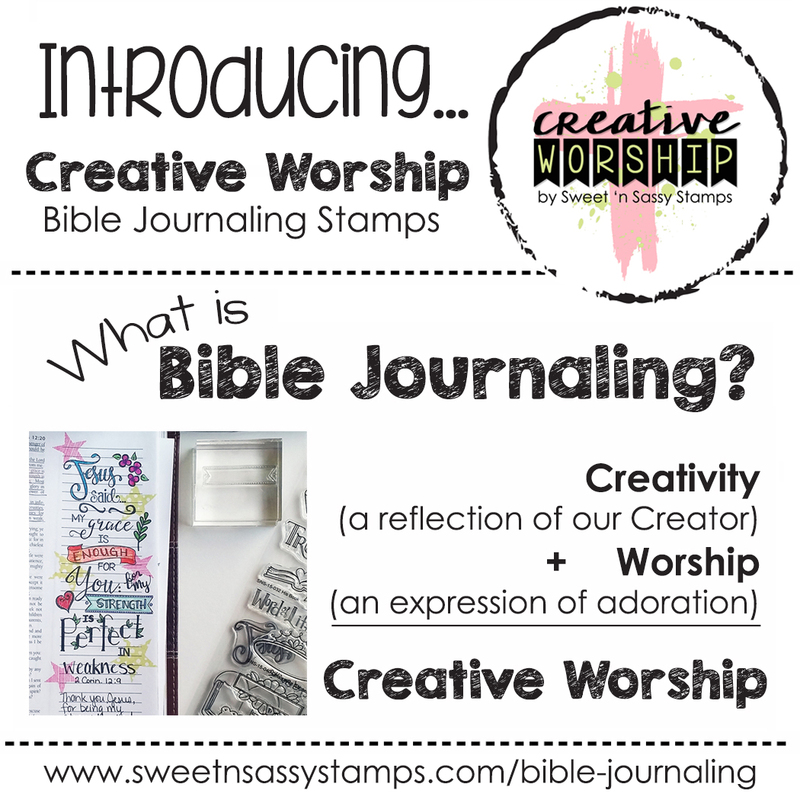 Hi Sweet 'n Sassy Stampers! 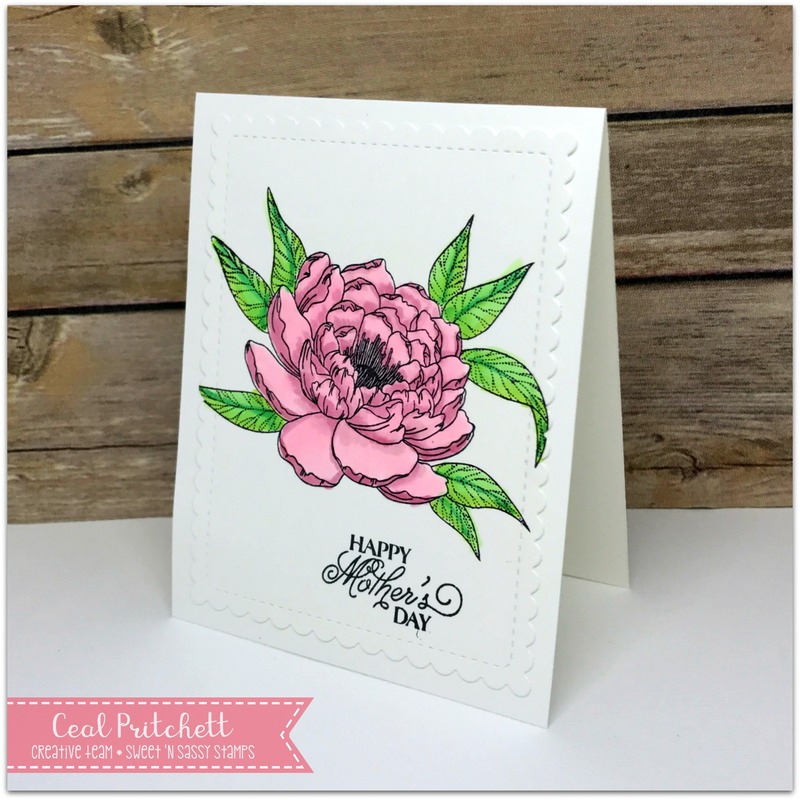 It's Ceal here to share a card with you using the Peaceful Peonies set. I started with a white card base and a panel cut down with a stitched/scalloped die. I stamped, the image with Memento ink and colored it with Copic markers. For the greeting I used the "Happy Mothers Day" from the Mason Jar Bouquet set. 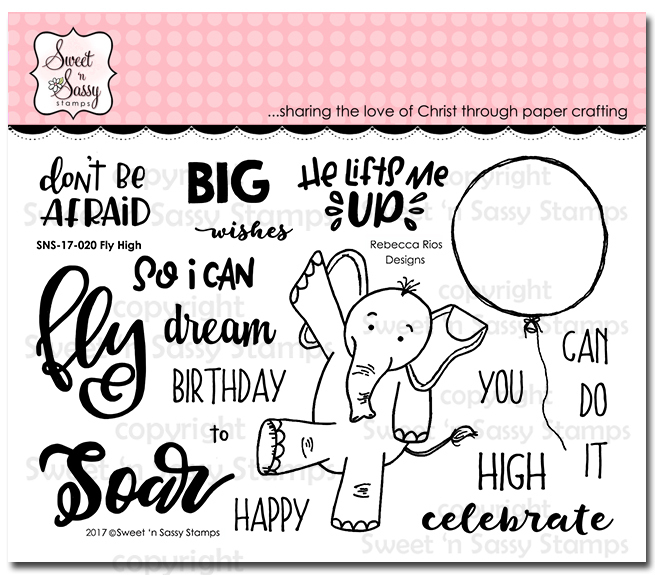 I always have a harder time coming up with boy birthday cards and this set Fly High is perfect for boy cards. I colored with watercolors and then paper pieced the balloons with random scraps. I decided to switch up my white stitching for black for a change. To everything there is a season....so the Good Book tells us. I've had need of some sympathy cards lately as one of the seasons of life. The brand new Mason Jar set provides exactly the right stamps for many occasions, including this one. 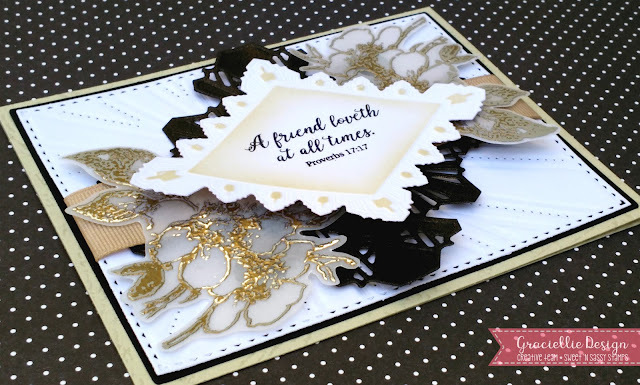 I created this card using this beautiful new set and a few other goodies from my stamp room. Hello Everyone!! It's Sheri Gilson here to share my final project as the March/April guest designer. I would like to thank Korin for having me the past two months!! I would also like to thank the amazing design team...you are a very talented and sweet bunch of ladies!! My card features the Pretty Potted Florals and Floral Greetings stamp sets. Hello Sweet Friends! Julie here to share a Mixed Media card using the new Peaceful Peonies Clear Stamp Set (designed by NinaB Designs for Sweet 'n Sassy Stamps) along with a modified version of the "Smakin’ Acetate" technique. To create the background for this card, apply melon and cherry ink to a craft sheet, spritz with water and press acetate into the ink, lay a piece of white cardstock into the ink and keep lifting and re-applying as desired. Stamp the sentiment from Peaceful Peonies with navy ink, trim the panel and mount onto navy cardstock before adhering to the white card base. Trim another piece of the background panel for the middle strip, mount onto a stitched rectangle die cut from navy cardstock and adhere to the card front. 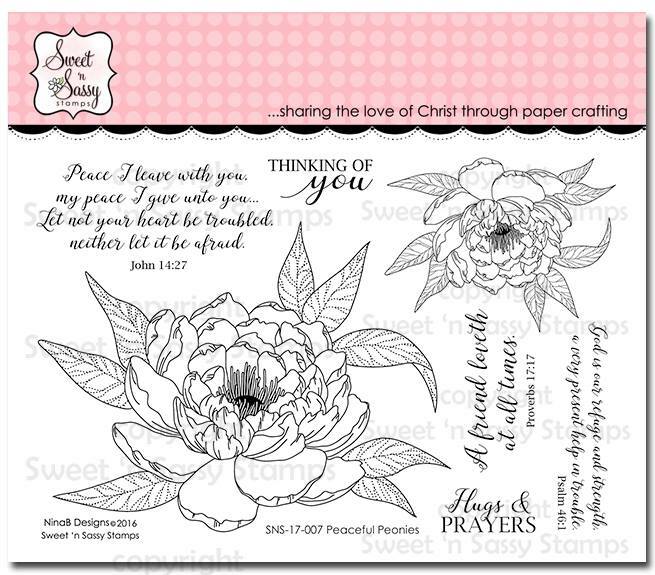 Ink the floral image from Peaceful Peonies with black ink, color with alcohol markers and fussy cut the image cutting the leaves apart from the image. 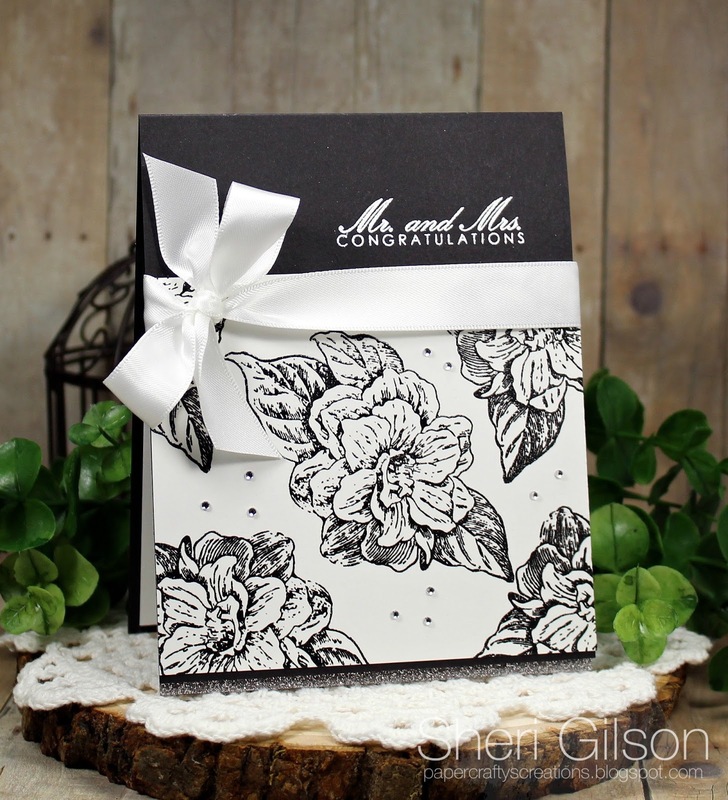 Mount the floral image using dimensional foam and finish off the card by applying shimmer with a clear glitter pen over the petals along with white highlights using an extra fine white paint pen. I love the images in the Peaceful Peonies Clear Stamp Set and hope I have inspired you today – hugs and have a blessed week, sweet friends! Hello! It's Gracie from Graciellie Design. Today I have a fun technique to share with you... Floral specialty papers can be beautiful, especially when they have a metallic finish. 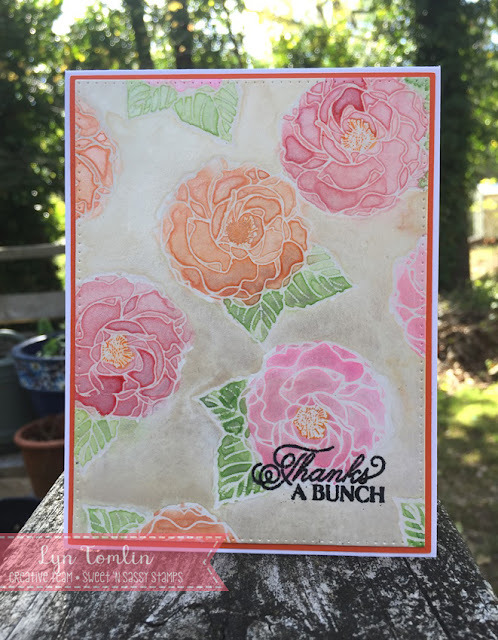 I decided to go ahead and try to make my own using Floral Greetings and Peaceful Peonies from Sweet 'n Sassy Stamps and Laser Silver Lustre paper. 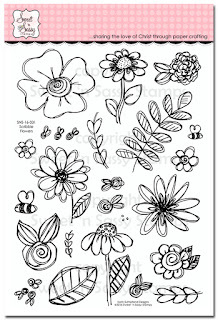 I stamped the flower multiple times to create a pattern. I used Color Box Mix'd Media Inx in Truffe and heat embossed it with Bridal Tinsel embossing powder from Ranger. I then colored the flowers applying a bit of Zig markers and spreading the color using my fingers. I kept layering the color until I was happy with the shading. This technique gives the flowers a stained look. 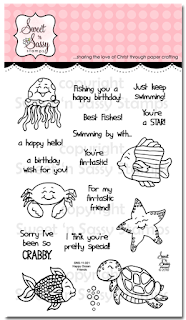 The glossy paper allows the color to glide and you end up getting a different coloring effect. I used the same ink to stamp the sentiment on Heavyweight Vellum 48# and cut a banner. I decided to fussy cut 2 flowers from the remainding stamped paper and adhere them on top of a simple pink frame cut from Mountain Rose Glimmer cardstock -which goes along perfectly with the Rose Quartz Mica / Metallic card base. To add dimension to the frame and flowers I used 3D Foam Strips and Foam Squares. I hope you enjoyed today's project idea. 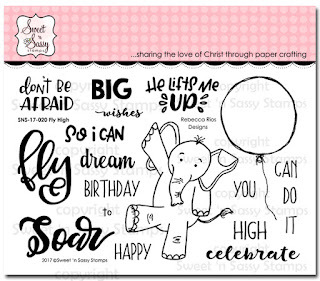 Make sure to visit Sweet 'n Sassy Stamps to check out these and other new clear stamp sets available now. For more ideas and inspiration visit SNSS blog! Hello SWEET Friends! It's Monika here today with a fun card. Will you join me for a cup of coffee? I love coffee, but right now I am taking a break... trying to cut back on caffeine and sugar. So this is how I am enjoying a cup of coffee today! 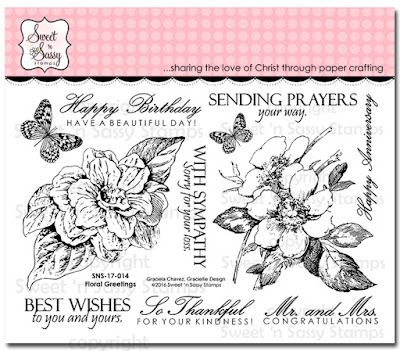 I used Creative Worship: Fill Me Up and Floral Greetings clear stamp sets on my card. 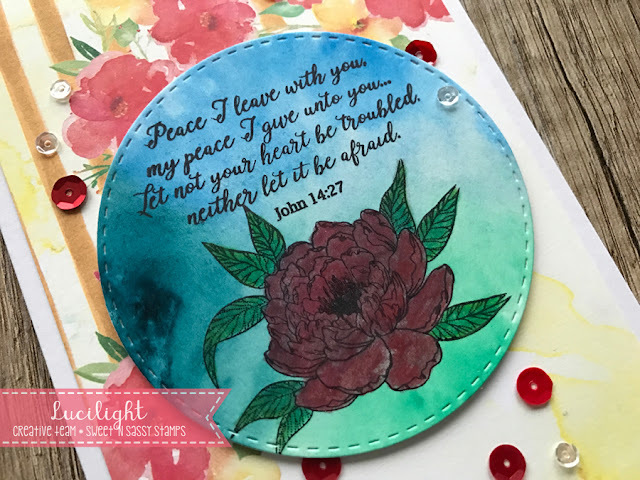 The background (water color cardstock) was sponged with green ink, splashed with water, dried, then stamped with the floral image repeatedly. As I was looking through my scrap pile, I found a piece of a2 card already stamped with the circle borders. The lines were crooked, so I set it aside ages ago... stamping the coffee cozy on it worked just fine and it added a nice pattern to my coffee cup. The heart was stamped on a scrap piece of water color paper, cut out, and colored with ZIG water color marker. I used the same color marker to ink up the check mark. Hello sweet friends! I hope you all had a wonderful Easter. The best thing about Easter is that we get to celebrate our risen savior every day, so here is an Easter blessing just for you! 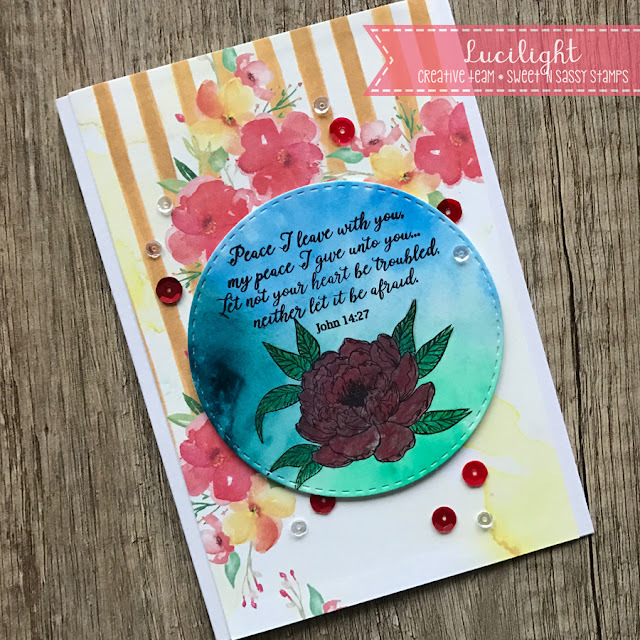 The background panels were made with Oxide inks...one was embossed with a sun rays embossing folder and the other sponged with a sun rays stencil. Jesus Saves is from the Good News stamp set from the Creative Worship line and the sentiment is from the He Lives stamp set. great-niece for her fourth birthday. 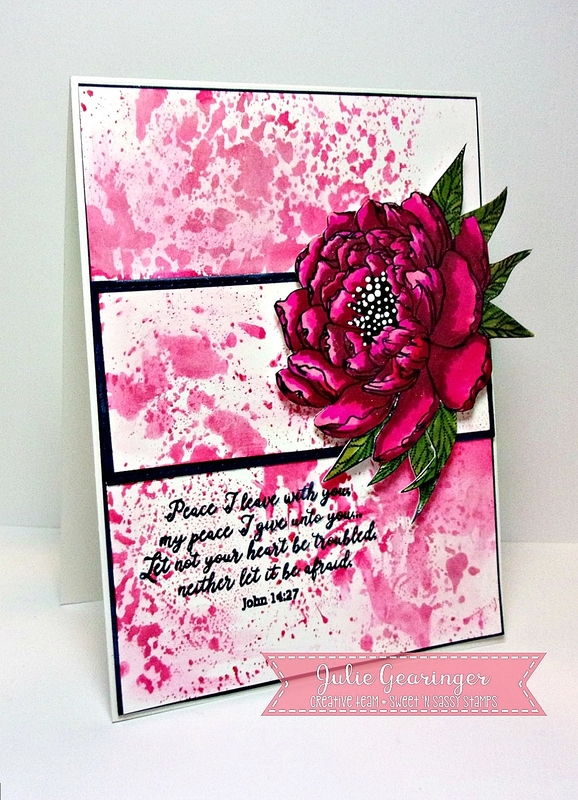 The background was again created with Oxide inks and a stencil. The seaweed is from the Scribble Flowers stamp set. 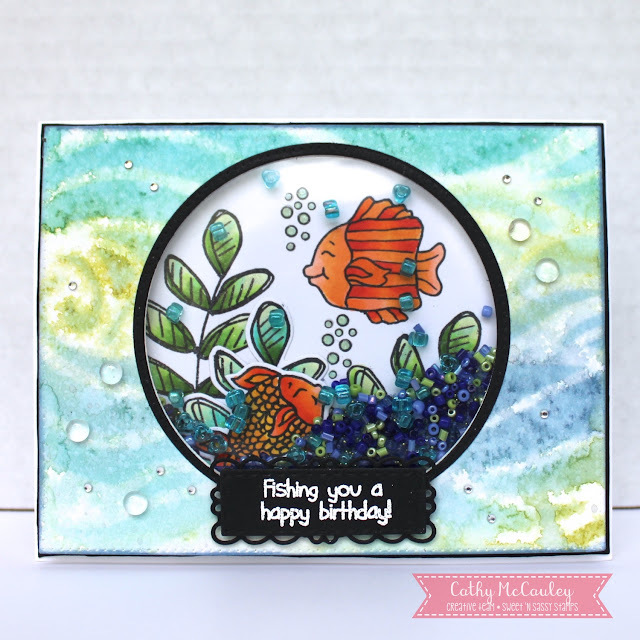 I decided to make my little aquarium scene into a shaker card for some added birthday fun! Be sure to check out these stamps and others available at the Sweet 'n Sassy Stamps Store. Thank so much for stopping by! Until next time...Happy Stamping! How about a fun background using a single stamp and sparkly water colors? I found a very inexpensive watercolor set at Michael’s (Artist’s Loft Pearlescent Watercolor Pan Set – $5) and decided "what could I lose?" They are really sparkly and fun up close. 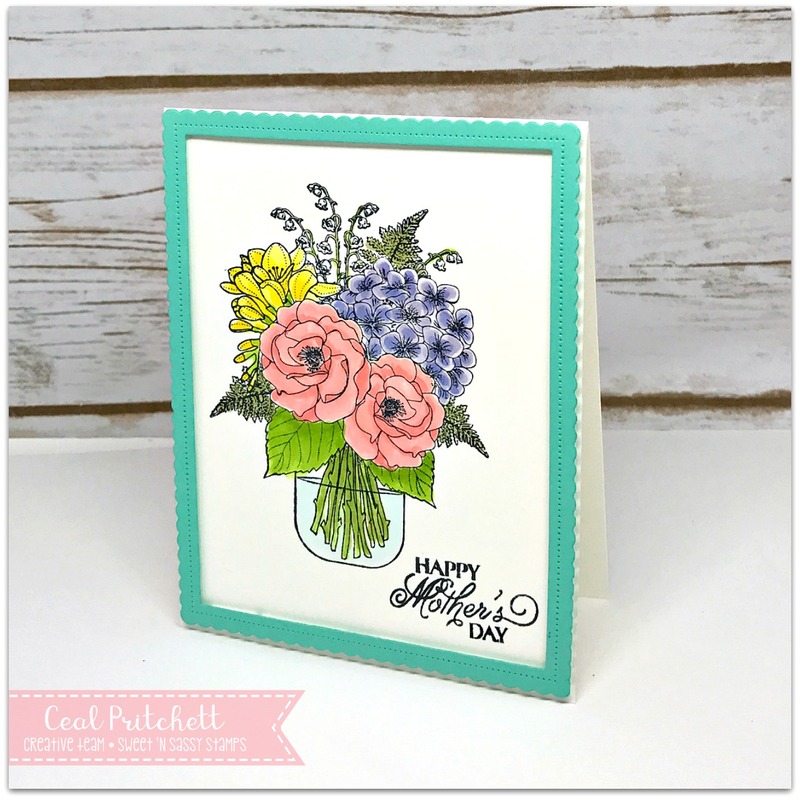 I used the new April Set – Mason Jar Bouquet offered a perfect flower and sentiment. My water color was pretty quick and easy. I let it air dry then I used a techniques from Jennifer McGuire to iron off the embossing powder on the flowers so the background was flat and ready for the sentiment. This was a fun technique – I hope you were inspired and I encourage you to try it! 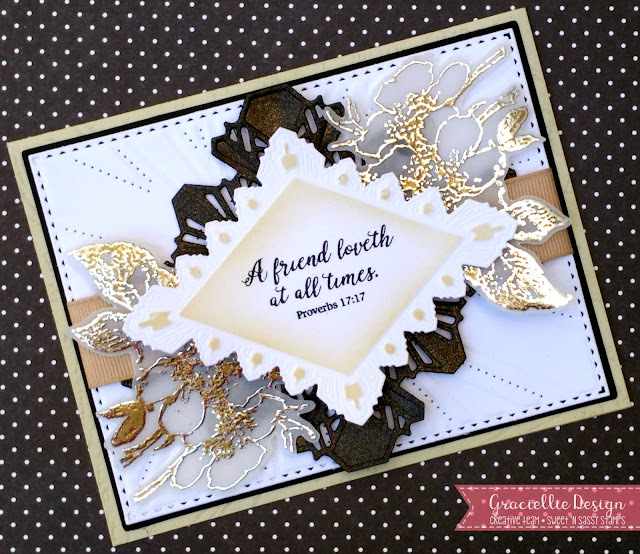 Today I am sharing a card using the Fly High stamp set from this month's release. I decided to make a tall card with the balloons flying up and then I thought I'd add the elephant hanging off the bottom. The balloons were paper pieced and I added Crystal Effects to make them shiny. This card measures 3 1/2 x 6 1/4 (start with 7 x 6 1/4) and fits into a regular No. 8 envelope. Most of us have those lying around to pay an occasional bill so why not use them to make a different size card? 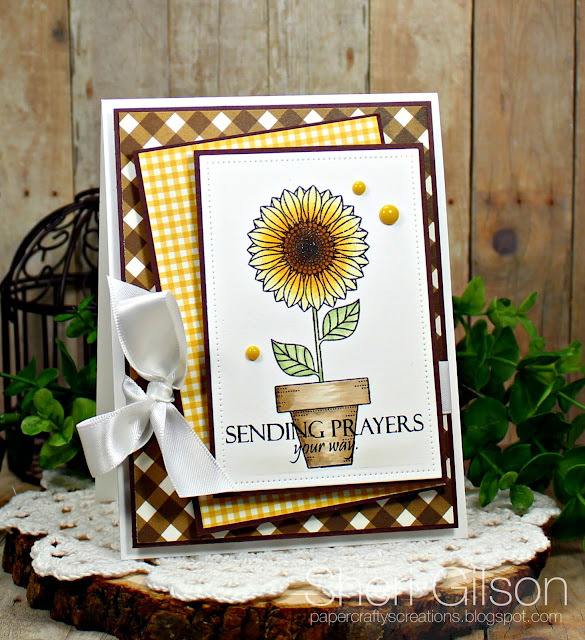 It's Ceal, here with a card using one of our new releases Mason Jar Bouquet. 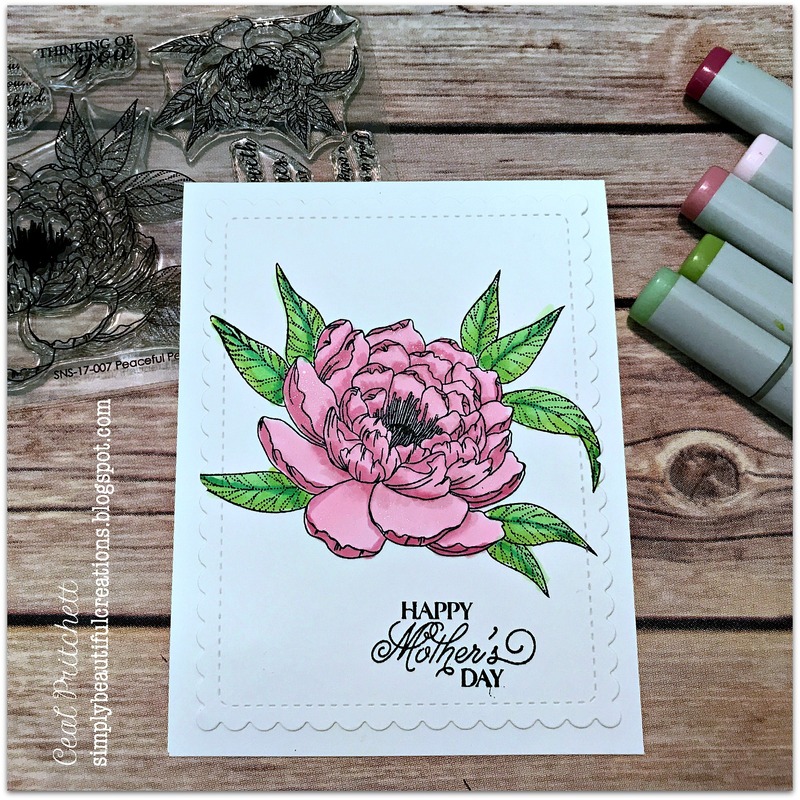 This is such a fun stamp to color and makes a gorgeous card for many occasions. To make my card I started with a white top folding card base and a frame, I stamped the image in Memento ink and colored it with Copic markers. Hello Everyone!! It's Sheri Gilson here to share another card as the March/April Guest Designer. Today I have a Wedding card for you using the Floral Greetings stamp set. I was just invited to a wedding this summer so I thought I would get a head start on their card. I first created a standard A2 black card base (4 1/4" x 11", scored at 5 1/2"). The sentiment is embossed directly on the card base with white fine detail embossing powder. I then took a piece of white card stock measuring 4 1/4" X 3 3/4" and randomly stamped the floral image using Onyx Black Versafine ink and embossed it with clear detail embossing powder. 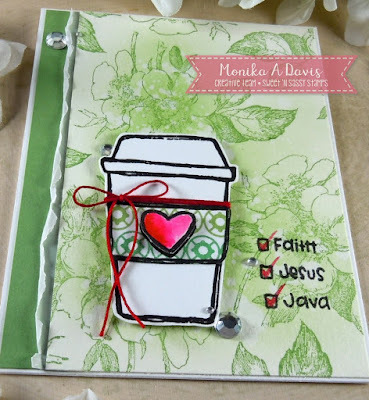 By embossing the images it added a bit of texture. I then added a strip of black card stock to the bottom of the white stamped panel before popping it up on the card base. Before you attach it I also added a strip of silver glitter paper to the very bottom of the card base. I also added some white satin ribbon and a few small rhinestones. I love how the design is elegant yet simple at the same time. 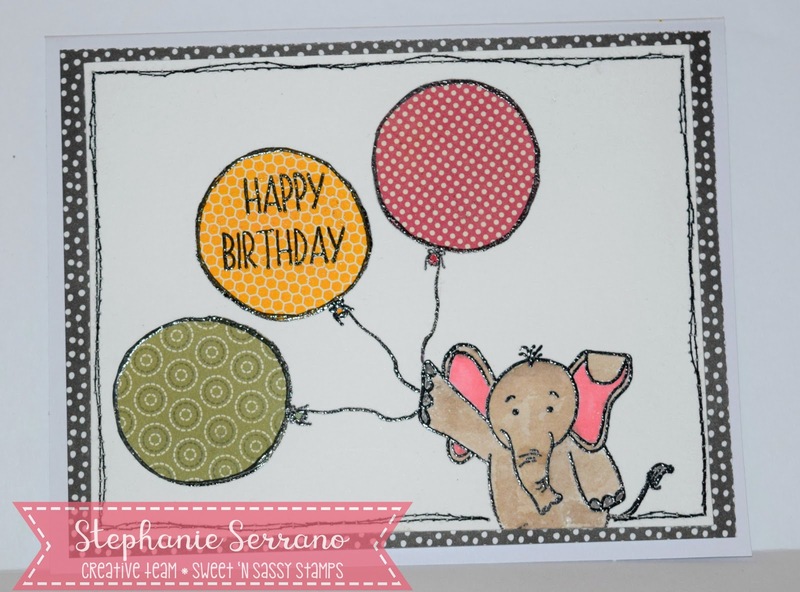 Hello Friends, Stephanie here with a card made from a New Release set available for Pre-order. 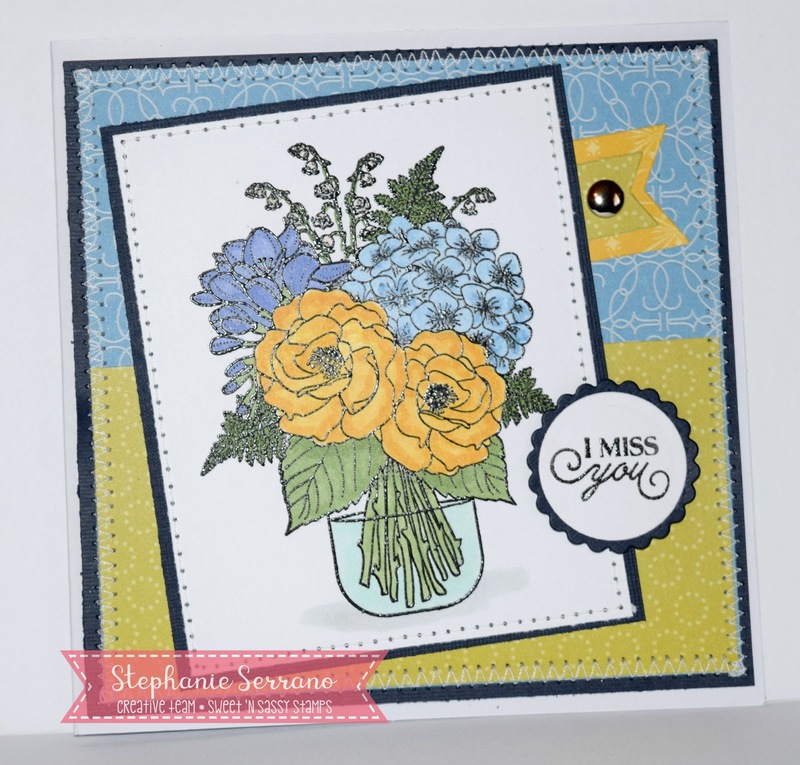 This set is called Mason Jar Bouquet by Nina Brackett. I colored with Copic Markers and the paper is from DCWV. 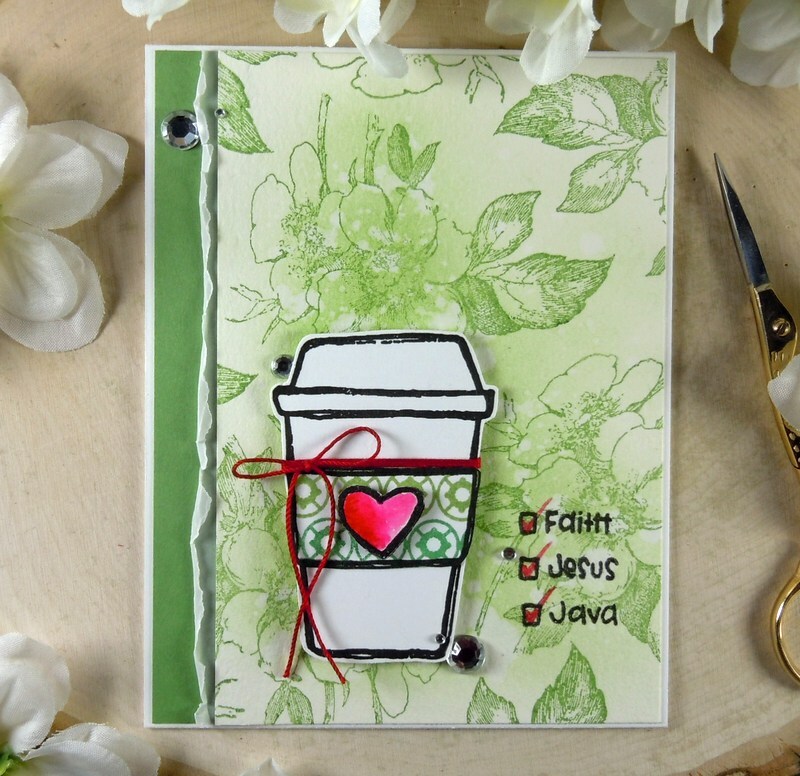 This set comes with 9 stamps, The mason jar, a single flower and 7 sentiments. Peace I leave with you... some very encouraging words from the bible and I think they are great for an encouraging card. Just to let someone know you're thinking about them. For this card I started with a watercolor background. I used a couple of blue/green colors to create the background and stamped the image on it. I thought the image needed a little bit extra color so I used colored pencils to color it. I think the colors turned out a bit too dark because of the watercolors, but I still like it. I stamped the sentiment above the image and die-cut the circle. I adhered the die-cut panel with foam tape and added a background paper that has a watercolor effect on it. I used a couple of sequins to give the card a bit more sparkle. For this card I used the stamp set 'Peaceful Peonies'. Hello, it's Gracie Chavez from Graciellie Design. I love using transparencies on cards. I usually use vellum because of how delicate it looks. 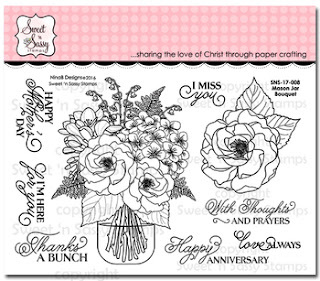 So I decided to use one of Sweet 'n Sassy's latests flower stamp from a set I designed -Floral Greetings- in a non-traditional way. I used a quick and easy DIY technique to foil the flowers on heavyweight vellum to create these stamped embellishments. First, I stamped the flowers using pigment ink (which works just as well as any embossing ink), and I then heat embossed the images in gold. But because I wanted to create a metallic on metallic effect I went ahead and foiled the flowers in silver. 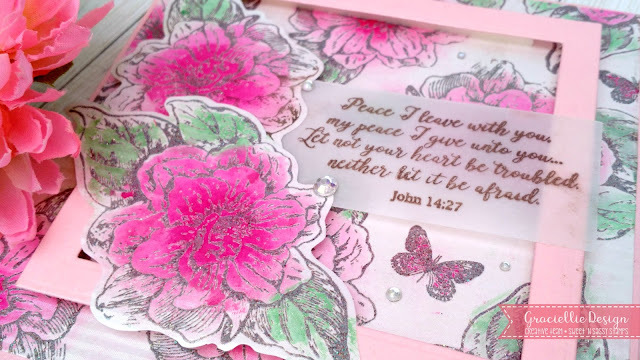 All I did was cover the images with a piece of silver foil transfer sheet and ran them through a laminator making sure to wrap the stamped flowers within at least 2 copy paper sheets folded in half, to avoid the embossing powder from melting completely. 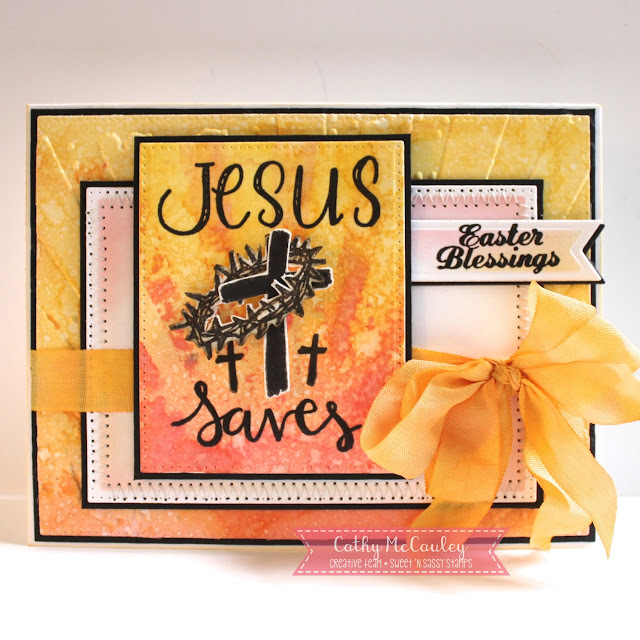 This trick will allow you to get a distressed foil effect that lets some of the embossed areas to show. In the end, you get a beautiful silver on gold metallic finish. 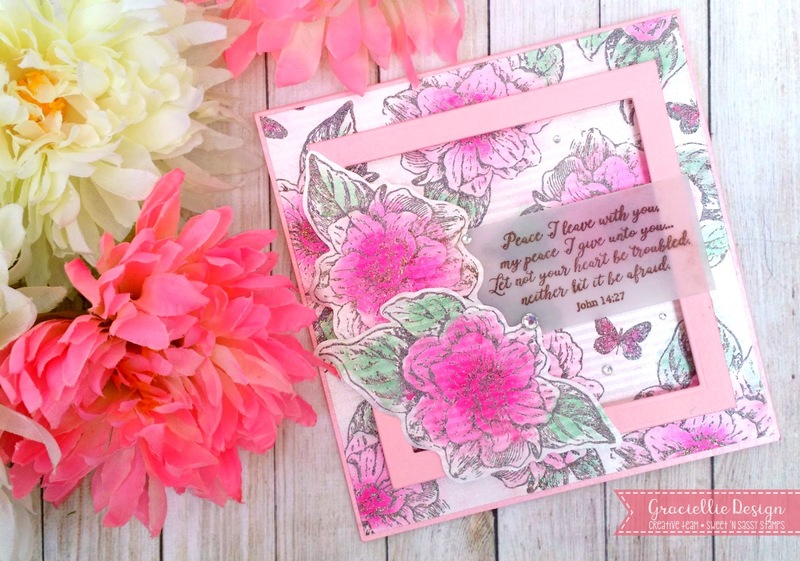 I fussy cut the flowers and used them to frame the wonderful verse from Peaceful Peonies. 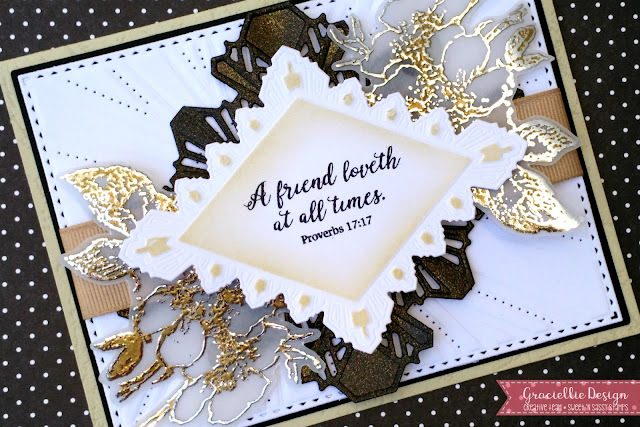 I layered a few die cuts and used metallic, shimmery, gorgeous papers to go along with the metallic tones on the images. I added a few touches of beige here and there to make the sentiment pop and tie all the monochromatic layers together. I love the result, but I'm sure this card wouldn't have been the same without these beautiful stamps! Hello Sweet Friends! 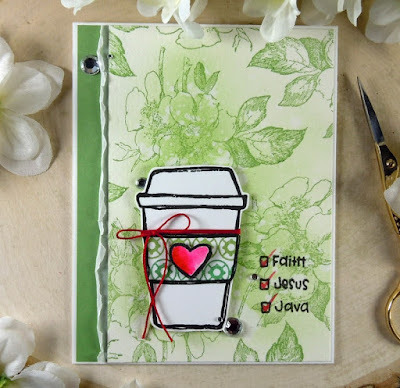 Julie here to share a quick Clean and Simple Mixed Media card that I created with the Creative Worship Clear Stamp Set, The Good News designed by Korin Sutherland. The Good News stamp set is perfect for Bible Art Journaling as well as card making. I love all of fonts in the sentiments as well as the cross images and the focus on what Christ has done for us. To create the side panel for this card, I used the acetate smooshing technique on white paper with yellow and orange distress inks and followed with a stencil brush using persimmon distress ink to soften the white paper. The word images from The Good News were randomly stamped with the same shade of orange distress ink and a bit of shimmer was added with a clear glitter pen. 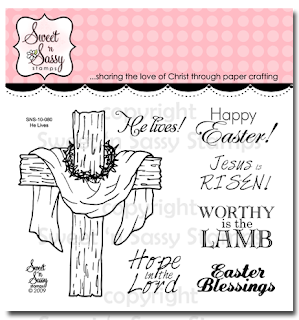 I stamped the cross image, crown of thorns and “Paid in Full” sentiment from The Good News with archival black ink onto white cardstock, fussy-cut the cross and crown images and mounted all onto dark brown cardstock. I finished off the card with a few sequins. I hope I have inspired you today – hugs and have a blessed week, sweet friends!